In the last 10 or 15 years we have seen an exponential increase in the amount and variety of available MIDI controllers from music production and A/V retailers. The other main change in this area has been the progressive paradigm shift towards affordability from most manufacturers, whose latest products are usually focused on getting a large piece of the expanding amateur and prosumer markets. Even though this is great news for most non proffesional users some pros and artist believe this transition has come at a cost. While it is true that prices for full featured MIDI controllers are cheaper than ever, the build quality, reliability and usage of strong and solid materials in these devices -such as aluminum, steel or wood- has dwindled year on year. Long gone are the days of workhorses like JL Cooper´s CS-10, Peavey´s 1600x, Philip Rees´C16 or Doepfer´s Drehbank, as these lifelasting controllers have mostly dissapeared in favour of increasingly disposable equipment on retailer´s shelves. Do not panic though!, there is still hope if you want to buy a controller that does not always need a backup ready, and that will be durable and dependable enough for the most demanding live performance and recording studio applications, you just have to look a little further from your typical mass made manufacturers´ offerings. There is an increasing number of small, boutique companies, that are filling this specialized niche market that goes beyond mass produced gear. In this article we will pick and summarize what we believe are some of the most interesting offerings from a selection of boutique controller makers. Beside this, we will focus on devices dedicated mainly to DAW and plugin control, that feature banks of buttons, faders and/or knobs -leaving out keyboards and other instrument specific surfaces. Let´s begin! Circlefade is a small french company run by Maxime Pham Thanh, a former electronics engineer that used to work in the automotive industry. It´s first product, the CF12 is – you guessed it- a slick 12 knob Midi controller that takes it´s aesthetic and feel from classic 70s style Hi-Fi gear. It´s 12 controls feature sturdy and beautiful metal rotary knobs, covering a bunch of potentiometers inside -not encoders- which are perfect to mimic the feel of a traditional rotary analog mixer or an analog synth. A welcome alternative to most mass produced control surfaces whose endless encoders would not make sense for these applications. These controls are mounted on a high quality brushed steel panel, surrounded by an eye-catching varnished beech wooden case. It is also USB powered -which makes it optimal for live use, one less wallwart to carry!- and very competitively priced at only 175 euros. The CF12 is a great example of industrial design, that shows us how boutique quality does not have to be outrageously expensive. Tinami -an acronym for This Is Not A Musical Instrument-, is a MIDI controller designed by José Sebastián Narváez Washima, a master student at Scola Superior de Disseny. It was shown at last years Sónar festival -in the Sónar+D area- creating quite a bit of excitement for such a small hardware maker. Apart from it’s cool retro -and Moog Moogerfooger like!- look and feel, featuring wooden sides and oldschool knobs, it’s main feature is the fact that it can be totally customised on order via Tinami’s website, whose pages feature a drag and drop app to build your perfect controller layout, with a mix of knobs, buttons and faders. While the Tinami is sadly not for sale yet at the moment -since the builder app is still in beta-, you can still contact the company for further info on specs and future availability here. Unlike our previous picks, Monome has been around for quite some time now. Since they introduced their beautiful pad controllers -with their latest iteration being the Monome Grid- and accompanying custom software solutions, Monome have been at the forefront of creative MIDI control and electronic musical instrument innovation. But Monome make more products beyond their now legendary matrix pad controllers, like the new Norns -an actual standalone instrument and music production platform-, their eurorack modules and the Monome Arc. Arc is more of a traditional knobby controller, but has quite a few twists to it that make it stand from the crowd. Apart from it’s beautiful aluminum knobs and case, Arc features a very useful and sleek array of led rings, that show the current status of each control with amazing resolution. It is like taking the idea of Clavia’s Nord Lead 3 or Moog’s Little Phatty control interfaces and taking it to the next level. It can also work with a lot of interesting software and scripts, as usual with Monome products. If you are interested in the Arc check our shop or Monome´s regularly, they make all their products in batches so when sold out you will have to wait for the next edition… but it is definitely worth it! 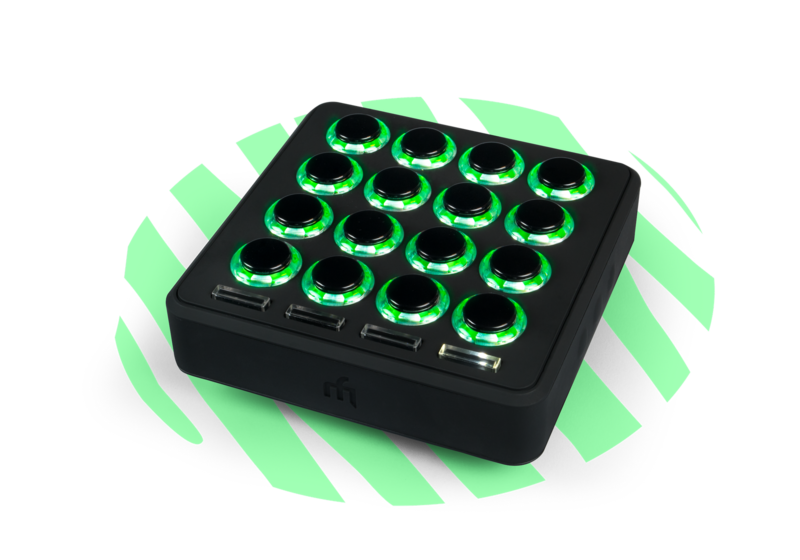 Last in our list is the Midi Fighter series of controllers from San Francisco based DJ Techtools. They make a few controllers like the Twister -a knob laden controller-, and the 3D & 64. These last two Midi Fighters are built around arcade machine style push buttons, and take their name -obviously- from the Street Fighter saga of Capcom games. Apart from the cool retro aesthetic that these give you, the main benefit of the japanese arcade buttons is their durability, since they can withstand more than 5 million presses -so they should definitely last a lifetime-. The controllers also feature led backlights, side buttons -in the 3d version only- and additional free software is provided for midi mapping applications so you can customise your “Fighter” to no end. More info here.